The Warm Fuzzies are crashing into the Athens music scene with unexpected force. I’ll admit that I had never heard of them before Wednesday night’s concert at the Melting Point, but apparently I’m the only one. They currently stand as one of the top three contenders for Flagpole’s Upstart of the Year Award, a veritable feat by itself considering the influx of good new music we get in Athens each year. Success couldn’t come to a nicer band; they invited Athens Music Junkie to come out and enjoy their show and asked so politely that we couldn’t refuse. The show opened to a small but suportive group at the Melting Point with Nashville-based band HeyPenny (a band I highly recommend checking out) opening. After HeyPenny’s energetic set came The Warm Fuzzies who kept up the same frenzied pace. 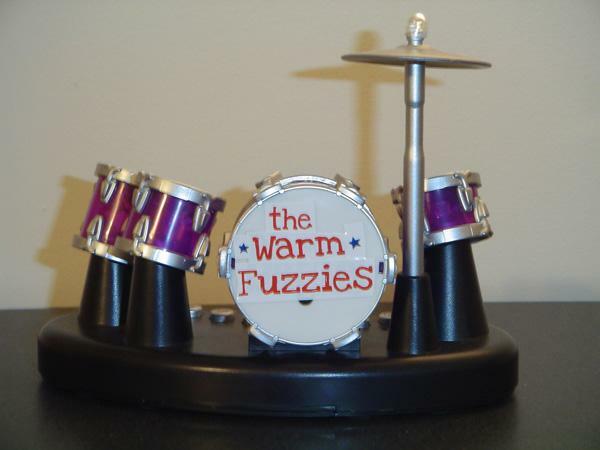 The Warm Fuzzies are what I would consider perfect summer music. They were energetic and endearing all at once even though the Melting Point was less than half full. I couldn’t help but wonder that if they were this excited with a half-full room, how amazing will it be to see them during Athfest? But back to why the Warm Fuzzies will be on my constant summer sound rotation. Simply put, this band is fun. They sang songs that ranged from the merits of cheese to falling in love in the Dairy Queen drive through; a welcome change from the over-emotional, self-indulgent whining that mainstream music seems to lean towards. Funny and silly, these are the songs I could see myself singing and smiling to as I drive with the windows down and no real destination. Most importantly for the club-kid in me, they make for great dancing music. Think of Weezer, an influence that the band easily admits to, in their most energetic moments and now inject some Red Bull into it. I couldn’t keep from tapping my foot and wishing there was enough room to dance around. The concert ended up being the best midweek pick-me-up I’ve had in awhile. This is definitely a band to keep an eye on but I’m sure all you trend-savvy readers know this by now. When a band releases a CD that smells like bubblegum and quotes Cyndi Lauper, I, for one, know I have found a summer mix staple. The Warm Fuzzies will be playing Saturday June 27 at Athfest on the Hull Street Stage outside at 2:40.